Justin Kluivert has impressed this season for Ajax. 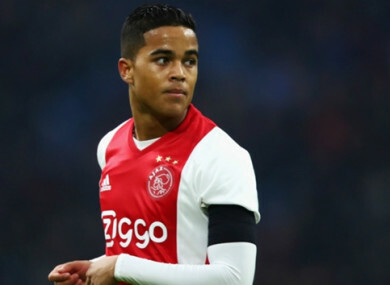 Justin Kluivert has impressed for Ajax. AJAX STAR JUSTIN Kluivert says he wants to follow his father’s example by becoming one of the world’s best players. The 18-year-old winger has replicated his father and Netherlands icon Patrick Kluivert by emerging as a teenage star with Ajax. After impressing last season for the Amsterdam giants, Kluivert has been one of the stars of the current campaign, scoring five goals in his last six Eredivisie appearances. The Ajax academy graduate knows he faces great expectations as the son of a Champions League-winning striker, but he believes he can do even better than his dad. “I want to keep the Kluivert name high,” he told Algemeen Dagblad. “Everyone knows the name. That must motivate you. The winger has fought his way back into Ajax’s starting XI after being used on the right wing at the start of the season before being dropped to the bench, but he feels he has looked bright again in recent weeks. “I’m happy that I’ve had the chance on the left wing lately,” he said. “That is really my position, but I must get better and must make more goals. I’m 18 years old and only just starting. Everything is different now. Opponents get to know you and I get covered twice as much. I see it as a compliment. Kluivert was linked to a move to Manchester United by British newspapers after he was pictured talking to Jose Mourinho after the two sides met in the Europa League final, but he maintains there was no talk of a transfer. “Mourinho did not have a second to discuss a transfer,” he added. “He thought it was nice to see me. Mourinho knows me from when I was a child and my father played at Barcelona while Mourinho worked there as assistant coach. Email “The son of a Dutch footballing legend is aiming to follow in his father's footsteps”. Feedback on “The son of a Dutch footballing legend is aiming to follow in his father's footsteps”.